Update: Pangu now works with iOS 7.1.2 too. The list below has been updated with tweaks for iOS 7.1.2, 7.1.1 and 7.1. As you might already have learned by now, Chinese group Pangu just took the jailbreaking world by storm with the release of its new, untethered jailbreak tool for iOS 7.1 and iOS 7.1.1. Although some tweaks should work right off the bat, others will require developer intervention before they can be deemed ready for prime time, and below, you’ll find a list of currently-compatible tweaks for Pangu-jailbroken devices. Some of our more revered tweaks, like Zeppelin, FolderEnhancer (iOS 7), f.lux, Barrel, and BiteSMS work just fine with Pangu, and as such, you should have no trouble installing them. For some, tweaks like FolderEnhancer, which offers a number of great tools for expanding your iOS folder capabilities and BiteSMS, which does likewise for the Messages app, are essential, and certainly upon jailbreaking my own devices, they are just two of a small number of tweaks that I feel very relieved to have by my side. 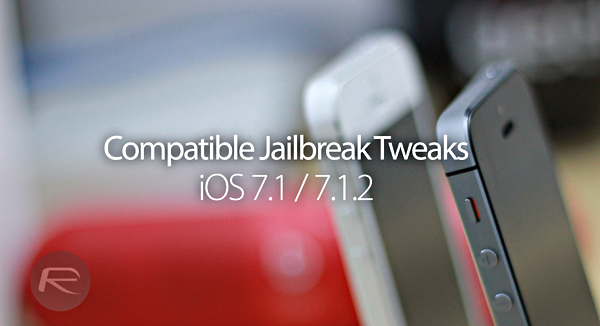 Unfortunately, there are a number of tweaks that are not yet compatible with iOS 7.1+ and thus, will not install on your freshly-jailbroken device running this software. These include Apex 2 (iOS 7), FolderIcons and PasswordPilot. Thankfully, the list of tweaks not functioning is far shorter than the list of working tweaks, and although we hope to see the insanely-useful PasswordPilot firing on all cylinders in the near future, those looking to benefit from its password-inserting powers will have to sit patiently for the time being. A number of other tweaks, like LockInfo7 and Five Icon Dock work partially, but can cause crashes and other issues, invariably forcing your device into safe mode. As such, you may be able to get away with installing them on your device, but in truth, you’re better off waiting until the authors of these tweaks have made the necessary adjustments. Below, you can find a definitive list of tweaks that do work, those that don’t, and those that are only partially functional. Ideally, all of these tweaks would work right away, but in due course, we’ll hopefully see the necessary updates applied to bring our much-loved tweaks up to speed with the latest jailbreak. You can go here to find a complete list of tweaks that are constantly updated. On zeppelin i put a carrier text on and now i want to change the text but when i do it stays the previous text everytime i try to change,you can see the new text pop up and then go right back previous text.Any body whats goin on?